Artigo / English / Gonzalo Gómez: "Maduro Is Dismantling the Revolutionary Process"
Gonzalo Gómez: "Maduro Is Dismantling the Revolutionary Process"
In an interview with Esquerda.net, Gonzalo Gomez, spokesman for Marea Socialista, denounced that the Venezuelan Constituent Assembly is "adapting the Venezuelan political and economic regime to the interests of the bureaucracy and its process of assimilation to capital." The government of Nicolás Maduro deepens the extractive policy and the transnationals expelled by Chavez return. By Luis Leiria. When the elections for the Constituent Assembly of Maduro were held, the movement Marea Socialista denounced it them as an undemocratic coup, which was intended to avoid the convening of general elections at that time. What role has the Constituent Assembly played since then? Well, first of all, it must be said that this Constituent Assembly was convened in the margins of that established by the Constitution of the Bolivarian Republic of Venezuela, which establishes the need to hold a prior consultation in a referendum so that it can be convened. And that it is necessary to submit to popular consideration, in this consultation, the conditions of the call. Nonetheless, they convened this Constituent Assembly and established rules that ensured the State apparatus and the PSUV the ability to shape the Constituent National Assembly (ANC). Therefore, regardless of whether it has been subjected to elections, it turns out to be a constituent of constituted power, not of sovereign popular power. It is true that some of the leaders of workers 'or peasants' trade unions are in the Constituent Assembly, but we are talking about something purely functional to the state bureaucracy and where the predominant are people who even had functions in government, such as ministers or vice ministers, or presidents of State enterprises, or holders of important positions as ambassadors, etc. That is to say: it is not reflected the popular movement and the expressions of popular power. And I would like to say that, in Venezuela, these expressions have been copied, patronized, and instrumentalized at the service of the party-state apparatus. Thus, the Constituent, I insist, is not of popular and sovereign power, but of the constituted power that usurps popular sovereignty with a semblance of legitimacy. A situation was created with a Constituent Assembly and a National Assembly. Yes, there has been a kind of duality of powers, but in reality there is a process of concentration of all powers with authoritarian, pseudo-institutional and legal-looking mechanisms. At this moment, the Supreme Court of Justice is completely subordinate to the government; the National Assembly was considered "in contempt" because four Members were accused of being fraudulently elected. Instead of suspending these four votes, what they did was to invalidate all decisions of the National Assembly, without ever being called new elections to replace these deputies. Faced with an assembly that was won by the right and by the political sectors linked to the traditional bourgeoisie, the form used to annul the loss of this House was an antidemocratic subterfuge, because the obligation of Maduro's government was to rescue the popular vote, to win support to maintain control of the assembly, but with a correct policy. Yes, indeed. The General Attorney was dismissed and replaced for having questioned the Supreme Court of Justice and also questioned the convening of the National Constituent Assembly in these terms. But we must also say that what has been the National Constituent Assembly and the way it has operated is not something that we can consider progressive, or in tune with the Bolivarian Revolution. First, because there is almost no discussion, debate, elaboration of proposals that come from below. In addition to making a few rallies, with many applause, there are no mechanisms to collect the will of the Venezuelan people. And what the ANC has approved is regressive. Their aim is to dismantle the revolutionary process. This ANC is placed as plenipotentiary, as supraconstitutional, leaving us in a situation of almost suspended and uncertainty regarding the validity of the Constitution of 99, Chavez. Among the things I can mention, recently approved by the ANC, is a constitutional decree-law protecting foreign investment. That replaces the way in which transnational corporations and the investments of other countries take part in conditions prejudicial to the sovereignty. And this was said by some prominent intellectuals, such as Luis Brito García, an important writer who has generally had positions of support to the government of Nicolás Maduro. He pointed out that with decisions like this, the result is to undermine the basis of what has been won in terms of national sovereignty in the Chávez period. So if we see what the ANC is doing, it is not strengthening workers' rights or regulating labor. What it is doing is to adapt the political regime and the Venezuelan economic regime to a new situation that responds to the interests of the bureaucracy and its process of assimilation to capital. There is a story that shows well the character of this National Constituent Assembly and why it is not a Constituent of popular power. In the elections for mayor of Simón Planas, in the state of Lara, a candidate was nominated as a candidate whose designation was made by election in the commune of El Maizal, a peasant commune, productive and fairly well organized. 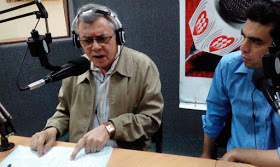 This candidate, Angel Prado, presented himself and the Communist Party and the PPT, members of the Patriotic Pole that supports Maduro, decided to replace an earlier candidacy, in which they went with the PSUV, and present this candidate. The National Electoral Council did not change the name of the candidate on the electoral list and the ANC said that it did not authorize this constituent to run for election. He had to obtain authorization from the ANC. But many leaders of the PSUV who were constituents were allowed to be candidates. The people of this commune took to the streets to protest, closed roads, made popular assemblies, went to the National Electoral Council, went to the Supreme Court of Justice, demanding that Prado be declared victorious. Where a commune has won, the political regime of this Constituent Assembly refuses to acknowledge it. One does not want that the popular power has real space of power in the institutions. What happens is that the elections that are to be convened in Venezuela are under undemocratic, disadvantageous, irregular conditions, summoned by surprise, compress the electoral calendars, change the rules from night to morning, there are registered candidates who are not accepted ... When they can not have another resource, they even remove candidates in the middle of the process and even arrest them. We denounced the case of the former mayor of Cumaná, in the state of Sucre, who had been a candidate for governor, and shortly thereafter, did not run for the mayoral elections but was at the head of the promotion of 15 candidates from that state . He was then arrested, charged with embezzlement, supposedly four years earlier when he was in the chamber. I learned that the accusation was that he had not returned a gun that is given to the mayors for his defense, but he showed the return minutes. Still they kept him in jail and the trial was postponed. And so he was held until recently. It is in these conditions that we participate in the elections. But I must say that Marea Socialista, despite denouncing these elections, decides to participate because we think that we can not renounce our citizens' rights. We must try to exercise them, whenever and when we make this frontal complaint. We participated in alliance with another organization that has legality, because the Socialist Tide was prevented from starting its legalization process. They did not authorize us to collect signatures under our name. And we introduced alternative names. One of them was "We". Which has now been used by the President of the Republic to name that kind of party movement that created Nicolás Maduro to have a game of two formulas in the elections, and who knows what other purposes. It is a party assembled with the apparatus of the State and with the resources of the State. But we at Marea were prevented from starting the legalization process. We were denied by the National Electoral Council and we appealed to the Supreme Court of Justice, which summoned a hearing, in what became practically a political trial, questioning that we could use the name of Socialists because we attacked the government; and then never again called the trial hearing. The Supreme Court never made a pronouncement, so we could never begin the process of legalization. But we were in alliance with the Popular Political Unit 89 (UPP 89) and I must say that of the 385 municipalities we managed to present applications in 181 and that in several states and municipalities we obtained very important results. Some cases of candidates who obtained 30 and 40%, 20 or 15%, considerable percentages. In some places, such as the Portuguesa state, this electoral force was the second, immediately after the PSUV. We think there are places where those who stayed in 2nd or 3rd places could have stayed in 1st. But you have to face the use of the media, communicative hegemony of the state apparatus, you have to face the use of state resources, you have to face the use of the security corps used to intimidate ... A number of conditions that deny what we could understand a socialist democracy or participatory democracy that was inscribed in the Constitution. Socialism is not a trap. Socialism can not be done with discrimination. Socialism must have breadth, participation, debates, discussion. With opportunities to intervene and this can be used for decision-making. It is not that Nicolás Maduro asks: "let me get ten proposals" and from all subsides of the party and social organizations come thousands of paperwork with ten proposals. But then we do not know what happens, who selects them, which are the majority. This is the scenario: simulation. And what do you think of the presidential elections scheduled for April 1? They were summoned for April, although constitutionally they should be held in December. They argued that the opposition had called for the advance of the elections as a mechanism for Nicolas Maduro's departure. But as the government has been able to build on this new manipulative electoral model, it feels safe enough to be able to call and win elections, even if they are a minority. And this is the situation that exists now. Most of the opposition will not stand for election. Some were because they were being outlawed, or because they no longer had the opportunity to participate because they did not meet requirements, others because the court withdrew their candidates the right to present themselves. There were no agreements in the negotiations made by the MUD and the government - and I must say we are against, since it is intended to resolve the affairs of the country between the right-wing opposition and Maduro's government. What about the rest of the paper? What are we, the others? What are the rest of the political opposition and the rest of the social organizations? They can meet in the Dominican Republic with mediators who have been linked to bourgeois governments and who have their connections with sectors of imperialism to decide what will happen to the country. We disagree with that. We defend a multi-dialog with popular, democratic participation. Will Marea Socialista present a candidate? We intended to promote an application that emerged from what is known as the critical, democratic chavismo of the radical left that questions the government of Nicolás Maduro. In fact, we participate in a platform where there are several of the former ministers and former Chavez ministers who had a very important participation. We have been working together with them, who have been removed from government, but not because they are corrupt or because they are not ashamed. They were pushed aside because they defended the "coup" Chavez spoke of before his death, a shift of democratic radicalization of the Bolivarian Revolution to achieve its objectives. The deadlines set by the government, the conditions under which the elections were convened, do not allow the time for discussions, agreements, consensuses, and the construction of joint programs. The devices have already solved everything. They already have candidates, they already have proposals, everything is ready and set up. It is only then that they announce the elections and summon the others. And they do not give the time, reasonable deadlines, to be able to solve the situation. The organization with which we went to the elections decided to launch its candidate: UPP 89 will launch Reinaldo Quijada. We intended to have room to discuss other possible applications, including some arising from this group of former ministers of President Chavez, or from any other source. It was also possible to agree on programmatic proposals and the formation of a government team discussed with the people. Because it is not presidentialism, the figure. 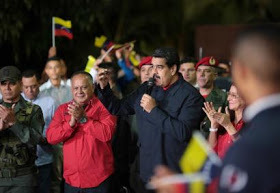 It is about being able to assemble teams of fighters and fighters of the revolution to be able to say to the country: "There is a possibility here of the exercise of a revolutionary and popular governability." We still do not have a decision about what we're going to do. In principle we are inclined to participate in the electoral processes. Deciding a presidential figure in these conditions is not the same as participating in the presidential election to gain local achievements to advance revolutionary work. The situation is different. But the options we have are: Maduro, those who are right and agree to participate, who are very few - a couple of candidates - or some applications that have appeared and that have the characteristic of being critical, or have broken for the left with the government by Nicolás Maduro. Among them was the one I mentioned, and General Francisco Visconti Osorio, who was a companion of Chávez on February 4, 1992, in the civic-military uprising, was also the commander of a second action that that same year, which was that of November 27. He identifies himself as Bolivarian, claims to be in favor of the Communal State and of a constituent process, despite having some proposals that from our point of view have an antiparty character - he distinguishes between parties and popular and social movements, we think they have of the existence of different forms of organization - and also considers that socialism and communism, Marxism, are Eurocentric expressions, and that Venezuela, as a mestizo country, should not adopt these guidelines. Despite making statements in defense of the shape of the communal state. Well, as you see, there is much to review and discuss and we have relationships with both sectors. The other alternative would be abstention. There are some sectors of critical Chavism who are willing to make alliances with right-wing organizations because they say that it is necessary to form a strong opposition and get Maduro out anyway, but we do not think that is the alternative. There must be a broad framework, but that claims or values the achievements of the Bolivarian Revolution, and at the same time marks their very serious deformations. Over time, a power elite emerged from the bureaucracy that was accumulating capital through corruption, through the embezzlement of the Nation, which became a kind of lumpen bourgeoisie. That is why in Venezuela what happens. 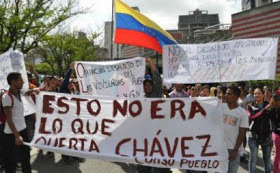 Because there is a change in the class condition of what was the direction of the Bolivarian Revolution. The economic situation is terrible because what has been applying the government of Nicolás Maduro is a deep and crude plan of adjustment. Measures of economic adjustment against the working class. They say they are against neoliberalism and all these things. But if you have a situation in which they take a worker's salary to a level of between 3 to 4 euros a month, anyone can imagine the meaning. The salary was crushed. The government says it's an economic war. It started a wild lock. There are some of these things; but more than economic war, what prevails is the logic of capital, the pursuit of profit. 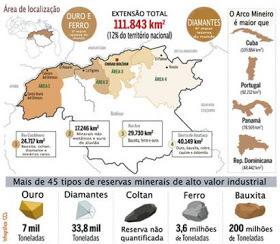 And in this, too, the bureaucracy that has embezzled the country, brought resources abroad, has money in tax havens because it has transacted with the transnationals and has taken advantage of this because it is opening the way to the entry of the transnationals and the emerging imperialisms in the country, for example in the Mining Arc. The state bureaucracy is involved in extractive smuggling, to withdraw products from the country, to use imports, even food, to benefit from the exchange differential with fraudulent, fictitious imports. Now there is a serious problem with the milk that is imported from Mexico into the boxes of the CLAP(2), it is said that it is affecting the children because it is an improper milk. At the same time, they pay the debt and they sacrifice the people to pay for it. A revolutionary government would at least have to start by auditing it, and once done, say, "Well, this part of the debt is illegitimate and we do not recognize it." But they can not do this because they are involved in buying and negotiating debt bonds acquired in Bolivars but can be traded in dollars. The change is paid and received, as they say in Venezuela. That is, there are interests of the bureaucracy itself in debt. They are interested in being "good payers" of debt, but not because this is a moral quality. Against this, it is evident that we can not support the government of Nicolás Maduro. We think that this government has to be replaced, but not by the right-wing opposition. We must build a political, revolutionary and popular alternative that will recover the keys of the Bolivarian Revolution, overcome its mistakes and deviations and move on. This is not an easy task. Obviously we are also against any form of interference or foreign interference. There was a lot of talk about that possibility. Is there a danger of a US intervention? We have the imperialist intervention, but it comes from China, Russia, and the trasnationals that are being reintroduced into the Venezuelan economy. We are afraid of the damage that is being done to the Bolivarian Revolution. Then we have the potentiality of the intervention. But I also think that imperialism plays with the stick and the carrot. It uses hard mechanisms, threats, but it also tries to obtain in the negotiation the possible concessions that the government of Nicolás Maduro, at a certain moment, can give. We must reject this. There are sectors of the opposition that call for a foreign intervention. We say that aimed at not having a foreign intervention, or to make it more difficult and make the people combat this intervention, it is necessary to change the government policies and to make a transformation. These policies are the ones that are putting us to a great extent in this scenario of vulnerability and risk. 1. After this interview, the National Electoral Council postponed the elections for May 20. 2. Local Committees of Supply and Production. 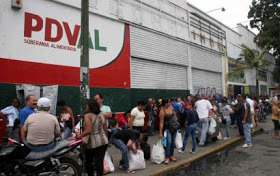 System implanted by Nicolás Maduro in April of 2016 to sell food baskets at subsidized prices and to fight the shortage. Baskets are only sold to people registered with local committees and may include wheat or corn meal, pasta, oil, rice, sugar and milk.